A salvia with many uses in the garden is Salvia leucantha, (pictured right) is also known as the ‘Mexican sage’, a number of cultivars are now available so a little variation in colour and form can be expected. One of the wonderful things about S. leucantha is that it will flower during winter, even in Melbourne, and a show of colour is always appreciated during the cooler months. 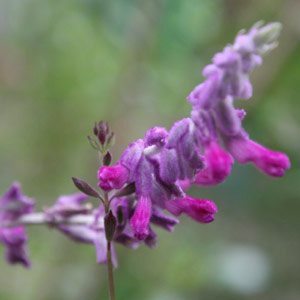 With the popular Salvia leucantha ‘Santa Barbara’ being a deep pink to purple flowering cultivar with the added benefit of being a little lower growing than the species. S. leucantha ‘White Velour’ has attractive white flowers in late summer to autumn, while ‘Velour Pink’ has pink and white flowers. S. leucantha ‘Purple Velvet’ is another excellent purple flowering cultivar. S. leucantha ‘Midnight’ is mentioned, however we have not seen it available for sale in Australia. Like most salvias this is an easy to care for plant given a warm sunny position. Frost and extreme cold will knock Salvia leucantha back, however a quick prune and some warm weather will have it looking as good as new. You can prune salvias at just about any time of the year, and many gardeners will tip prune. S. leucantha is one variety that does tend to get a little ‘leggy’ and if left looks a bit sad after a few years. It can be pruned reasonably hard. Simply follow the stems back down until you see new shoots, sometimes very close to the base. Prune them back these. We do prefer to leave the heavy pruning until spring, and we always apply some fertiliser at this time as well. Like all clumping plants, S. leucantha will need to be divided after 4 – 5 years. Best done in spring in cooler climates, any time in warmer areas. Simply dig the whole clump out of the ground, divide it into 4 with a spade or an old saw and replant. Propagation is from seed or division of established clumps. 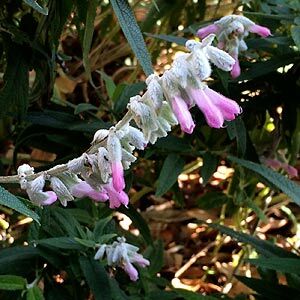 Where can you buy Salvia leucantha?